Walton Hall is a beautiful Georgian Mansion situated on an island surrounded by a 26 acre lake accessible only by a picturesque iron footbridge. Within the grounds of Walton Hall is the purpose built Waterton Park Hotel, situated on the mainland with views of Walton Hall and surrounding golf course. Accommodation and function rooms are available in both buildings. Walton Hall is formerly the home of Charles Waterton, an eccentric 19th century traveller and naturalist. The Squire transformed the lake and surrounding parkland into the world's first nature reserve. Today the estate has been further enhanced with a Championship 18 hole Golf Course which surrounds the hotel and lake. 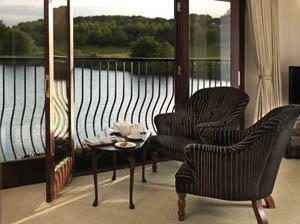 We have 65 wonderfully appointed bedrooms most with stunning views over the surrounding lake, woodland or golf course. Tucked away in a secret corner of the original grounds of historic Walton Hall is the delightful Gamekeeper's Cottage - a charming hide-away and the perfect retreat for that special night or weekend away. There's a comfortable sitting room, two double bedrooms and one single, well equipped self-contained kitchen, dining room, cloakroom and private parking. The cottage may be used on a self catering basis, or alternatively the facilities of the hotel are just a step away, including Charlie's Bar, the Bridgewater Restaurant and the Walton Hall Leisure Club with its wonderful lake view swimming pool. The cottage is a short walk from the hotel and is only accessible by 18 stone steps. Wether you’re visiting for business or pleasure, Waterton Park Hotel and Walton Hall offers unrivalled hospitality. And all of this is on the doorstep of some of Yorkshire’s greatest attractions including the world renowned Yorkshire sculpture park, the National Trust’s magnificent Nostell Priory and the award winning Magna Science adventure centre.